This is simply a follow-up post to “I Made a Smile,” posted two days ago. I received smileys from my partners and they certainly brightened my day. The first card, made by wenturner71, one of my “Professors United” pals on swap-bot, arrived yesterday. Wen is an amazing crafter and an awesome artist. If you have a moment, check out her upcycled wares and her ATCs. She also has an Etsy store, if you’re interested. “Groovy” was made with wax and alcohol inks. It is certainly groovy, man! Wen also enclosed a couple of quotes and some REALLY nice and PURPLE ATC background papers that I’m dying to use on something special! The second ATC, made by desolateros3, arrived today. Its name is “Smiley Face” and it came in an appropriately smiley-decorated envelope. Don’t they bring a smile to your face? These were made with acrylic paint for the background; Bobby McFerrin’s “Don’t Worry, Be Happy” sheet music .jpg; crackle accents; and embellishments and stickers from Jolee’s Boutique (Smiley), Sticko (treble clef), and DeJa Views “Girl Talk” (word stickers). I kept them simple. After all, a smiley face has no frills–it consists of a a pair of eyes and a smile inside a simple (typically, yellow) circle. Despite its simplicity, it is capable of making me feel all warm and fuzzy inside. I think what draws me to the faces is that my husband, son and baby sister have gigantic smiley face smiles that warm my heart. I used to tease my hubby and sister and tell them they both have big “smiley faces.” My son, also known as “my little smileycon,” has a smile that lights up the world. 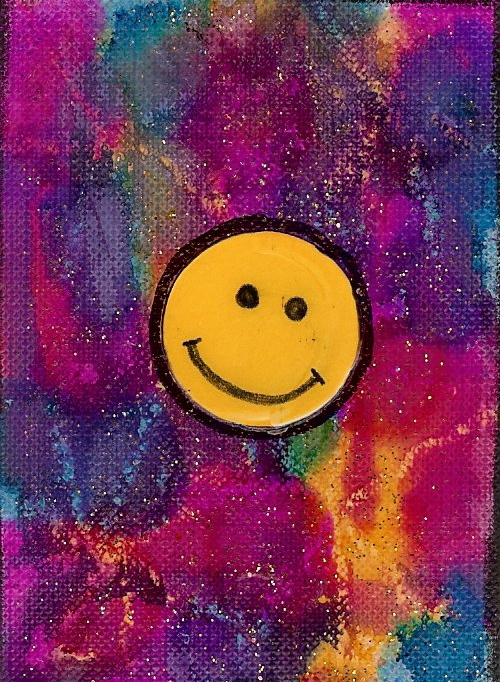 It was knowing I would get another one of those smiles that made me “give in” and join the “Smiley Face ATC” swap. Note: The colors of the treble clef match the colors of the smiley faces on each ATC, but they seem to have taken on other colors after photographing them.